The large, clear touch screen leads the user through everything from selecting a hymn to creating a play list for a service.Using the latest technology, the screen's white LED backlighting enables operation even in darkness, but uses very little power. 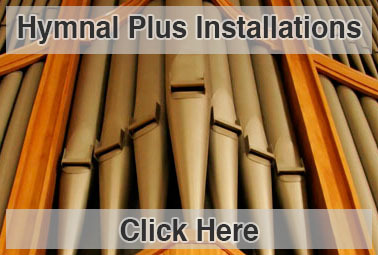 Organ - The 36 preset organ styles range from simple, quiet pipe organ sounds to the full sound of the mighty cathedral organ. Gospel organs with slow and fast rotating speaker effects are included. Orchestral - Piano, harpsichord, orchestral strings, together with the full range of orchestral and band instruments. Combination - Mixtures of instruments such as piano with orchestral strings, contemporary music group, pipe organ with orchestra, string and woodwind quartets, brass band etc. Rhythmic - Mixtures of instruments with drum rhythms: Contemporary music groups, marching bands, calypso band etc. You can also add a sparkling drum track to any style of your choice - there are 98 rhythms to choose from. 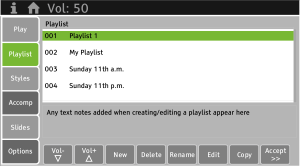 Using the Playlist feature, you can plan and store all the music for a service in advance. There's no limit to the number of playlists you can store, so you can create a different playlist for every service and give each one a familiar name for identification later on. What's more, there's no limit to the number of items you can store in a playlist. An item can be any of the thousands of built-in tunes or one of your own MIDI or mp3 files. It can even be a PDF slide (maybe the announcement of a forthcoming event). It's easy to add and delete items in a Playlist, and you can quickly re-arrange the play order with simple Move Up and Move Down buttons. 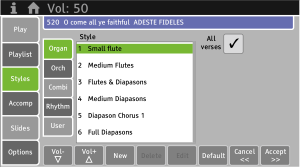 The new OurBook feature lets you create your own sub-list of songs from the vast repertoire of the Hymnal Plus. 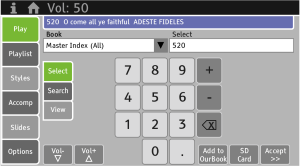 Whether you want to make up a numbered index to another hymn book or your church has its own unique collection of songs compiled over time, you can easily pull them into your own numbered list for future use. You can even share your OurBook with other HT-400 owners if you choose. For added ease of use, the HT-400 has a powerful built-in search engine. Just press the Search tab and enter any part of a first line, tune name or title (either on-screen or using the optional qwerty typing keyboard). The HT-400 will list all matching entries in its database within moments. You can search within any of the available book indexes, or search the entire database (the Master Index). If you are unsure which of the search results is the one you want, you can quickly audition them one by one. The Hymnal Plus doesn't play wrong notes and has incredible timing accuracy. In fact, it is far more accurate than any human could ever be. If you prefer a little more character, the new Humanise feature enables you easily to add subtle amounts of performance inaccuracy to the playback, to mimic a real musician more accurately. Don’t worry, you can’t ruin it – and it still won’t play wrong notes! The HT-400 features a built-in stereo amplifier and speakers (10 watts per channel), useful for personal monitoring (e.g. when preparing playlists) or use in outreach. When these are used on their own, the HT-400 automatically processes the sound to maximise the performance of the internal audio system. 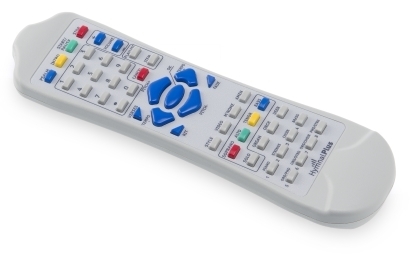 The HT-400 comes with both digital and analog* video output as standard. 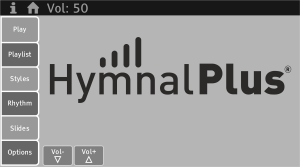 The main purpose of the Hymnal Plus will always be to accompany the singing of congregational music, but there are many resources available for subtly enhancing a service with visual elements, as well as the obvious use of displaying song lyrics. 8 preset orchestral and combination styles. 8 of your own choice. Choose any 8 from the HT-400's range of 246 preset styles, or any of your own personal styles. The HT-400 has built-in folding legs for desktop use, but on the back of the unit we have included a 75mm VESA-compatible mount. VESA is the standard mounting system used for flat-screen TVs, so a huge variety of mounts is readily available - everything from floor stands to wall-mounted fixed or swing-arm brackets and quick-release adaptors.